The 17th International Conference on Research in Advertising 2018 was held in Valencia, one of the friendliest cities in the world. This is the suitable place of light and color close to the beach to stimulate co-learning. The conference theme “Brand communication with multi touchpoints” encourages new insights into how profitability and customer engagement are affected by multiple and very diverse consumer touchpoints in an omni-connected world. The venue was at the University–Business Foundation of the University of Valencia, which is located in the historic city centre of Valencia. The ICORIA started on June 21st, 2018 with a welcome reception. On Friday June 22nd and Saturday 23rd 2018, the conference hosted the presentation of around 150 papers on various topics related to advertising and communication. More touch points include a Gala dinner on Friday night and a social event on Saturday. The conference fee for registration before May 21, 2018 is €375. The fee includes admission to all sessions, lunches, and refreshments, the welcome reception, the gala dinner, the social event, the conference proceedings and the €30 annual membership fee of the European Advertising Academy (EAA). The doctoral colloquium is free of charge for PhD students registered for the conference. The conference fee for registration after May 21, 2018 is €450. 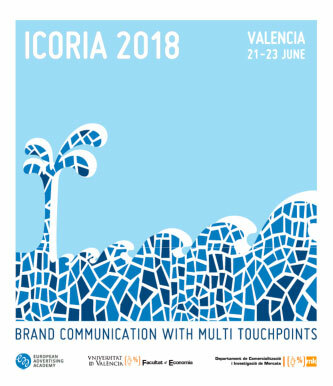 The Department of Marketing of the School of Economics at the University of Valencia and the European Advertising Academy are delighted to invite you to Valencia, Spain, for the 17th International Conference on Research in Advertising (ICORIA), taking place on June 21-23, 2018. The conference theme “Brand communication with multi touchpoints” encourages new insights into how profitability and customer engagement are affected by multiple and very diverse consumer touchpoints in an omni-connected world.